It’s no secret that children are naturally drawn to animals. As depicted in thousands of beloved children’s books, cartoons, and movies, the family pet often serves as confidant, playmate, and best friend to the youngest members of the household. That’s why it should come as no surprise that animals help kids with disabilities in countless ways. At Naperville Animal Hospital, the pet experts are constantly in awe of this special relationship, and we’d love to share more about this amazing bond. 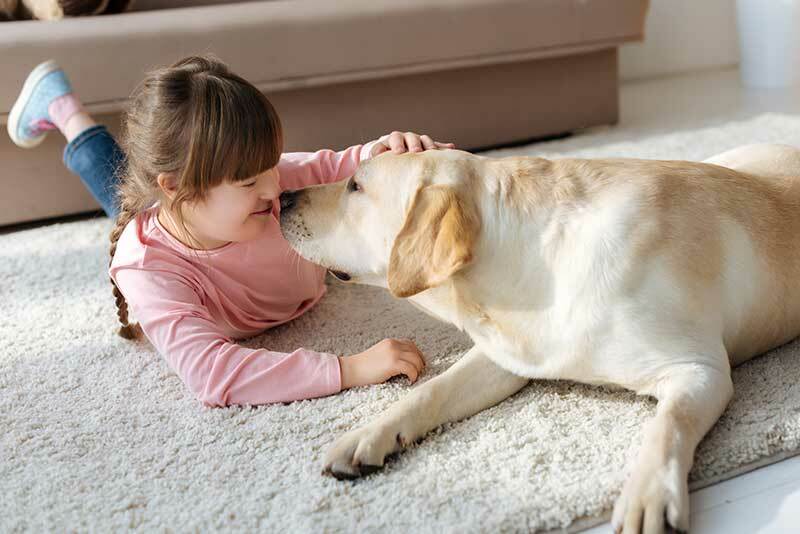 Whether it’s the gift of independence, providing life-saving care, or simply being there as a comforting presence, therapy and service animals offer invaluable support to kids with special needs. Protection – Dogs can help kids who exhibit repetitive motion behaviors that may be harmful. Sometimes, all it takes is a simple nudge from a service dog to divert a child’s attention and calm the behavior. Prevent wandering – Children with certain disorders may be prone to getting up in the middle of the night or wandering off in public. Service dogs can be trained to either “herd” the child back to where they belong, track the child, and/or alert the parents or caregiver. Mobility support – Service dogs can bring a good deal of independence to children with mobility-related disabilities. Lifesaving detection – Specially trained service dogs can detect a dangerous drop in blood sugar in children with diabetes or an impending seizure if a child suffers from a disorder. Dogs can help with medication, alert caregivers, and even move obstacles out of the way in anticipation of a seizure. Spending time with horses in a therapeutic manner (also called “equine therapy” or “hippotherapy”) is a growing trend around the world as a way to help children and teens with a variety of mental, physical, and emotional issues. Equine therapy has been shown to improve motor skills, balance, coordination, and communication among kids with disabilities. Especially children with autism can benefit from the physical connection they might have with a horse. All pets are special, and the unconditional love of a “regular” dog, cat, bird, guinea pig, etc. can have a profound impact on the life of a child with special needs. At Naperville Animal Hospital, we value each and every pet who comes through our doors. Please don’t hesitate to contact us with any questions or concerns.